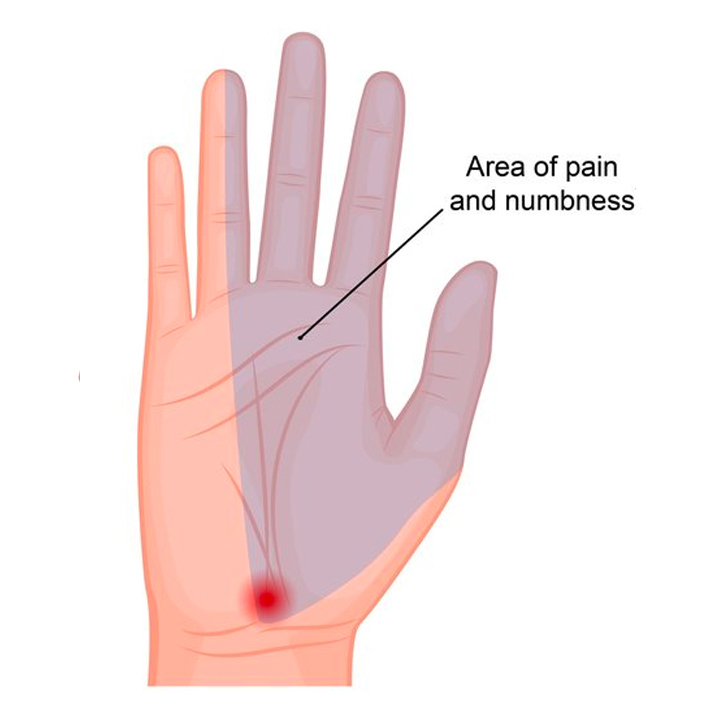 Carpal tunnel syndrome is a common condition that typically causes pain and numbness in the hand, especially the thumb, index and middle fingers. The pain often wakes people up at night. It is due to compression of the Median Nerve as it passes into the hand from the wrist. It is compressed underneath the Transverse Carpal Ligament. There are many reasons why the nerve may become compressed but commonly it occurs after repetitive use of the hand, during pregnancy or can be associated with a wide range of medical conditions such as diabetes or acromegaly. The diagnosis is usually confirmed by nerve conduction studies. This test is performed by a Neurologist and involves placing small electrodes on the arm and hand to measure the electrical conduction through the nerve. If there is compression of the nerve, the signals will be partially or completely blocked. Sometimes, other conditions that can cause hand pain and numbness must be ruled out. For example, nerve compression in the neck related to spinal disease. The treatment of Carpal Tunnel Syndrome is either conservative or operative. Conservative management may consist of simple analgesia, splinting the wrist at night or avoiding constant pressure on the wrist. Surgery is a relatively simple and effective procedure for Carpal Tunnel Syndrome. The operation is known as carpal tunnel release, or decompression and involves making a small 2cm incision over the middle of the palm, just beyond the wrist, and dividing the transverse carpal ligament, which allows more room for the median nerve. A few stitches are then used to sew the skin closed. The hand is usually bandaged for around 5 days. The surgery can be done as a day case under local anaesthetic. The risks of the operation include infection and blood clot formation in the skin, problems with scar formation, ongoing pain and, very rarely, nerve damage with numbness and weakness of thumb movement. Your surgeon will discuss the pros and cons and risks of the surgery with you in more detail at the time of your consultation.